The usual strawberry shortcake goes chocolate and gluten/dairy-free. Top with fresh mint and coconut cream”whip” laced with honey or maple syrup. Chocolate and strawberries are always a treat. Inspired by Nigella Lawson’s olive oil cake, I freshened up the recipe by using grapeseed oil and coconut palm sugar, and a few extra touches like dark chocolate. This dessert will please a crowd especially when native strawberries are plentiful in early summer! Preheat oven to 340 degrees. Mix together water and cocoa till smooth. Microwave the chocolate chips a minute or two, until they melt, being carefully not to overheat and burn. Stir till smooth. Mix the chocolate mixtures together and set aside to cool a bit. In a stand alone mixer or hand held, beat eggs, oil, sugar and extracts for 2 to 3 minutes until fluffy. Add almond flour, baking soda, and chocolate mixture and blend well. Pour batter into oiled half fill muffins tins lined with parchment paper. Bake for 12 to 15 minutes or until puffy and set in the middle. Run a knife along the edge of each cake and invert the muffin tins when cooled onto a flat cookie sheet. Cakes will fall flat when cooled. Remove parchment paper and top the bottom side of the cooled cakes with whipped coconut cream sweetened with maple syrupto keep this dessert non-dairy. Add fresh sliced strawberries and finish with a mint sprig if desired. Makes about 2 dozen. Serve with arugula salad dressed with jalapeno, chili and lime vinaigrette for a healthy spring “South of the Border” inspired meal. Asparagus or local fiddleheads are tender greens that shoot out of the ground in spring. Combined with leafy greens …such as the first pick of spinach planted in late fall … local ramps or native wild onions, along with chives (one of the first herbs in spring), this is one dish bursting with all the flavors of the new season. 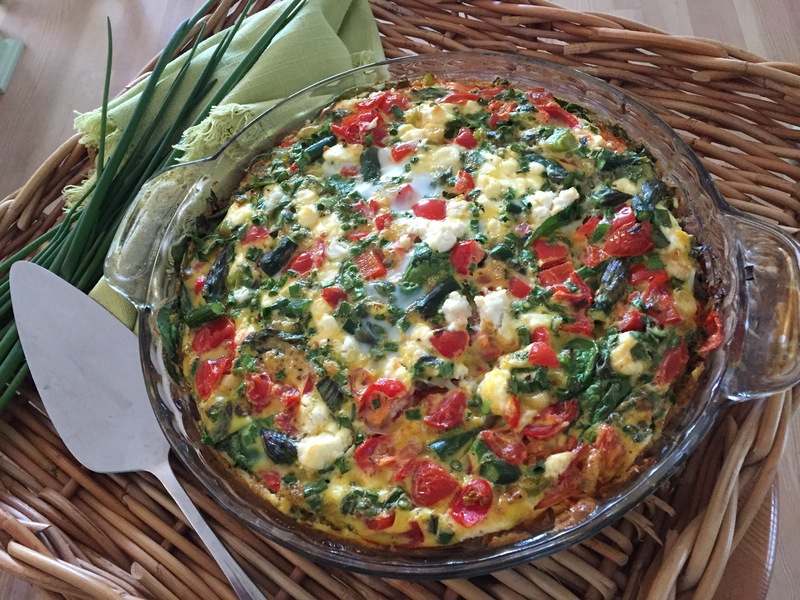 Add red peppers, grape tomatoes, lightly sprinkled cheese (I used chevre “goat” cheese) and a sprouted grain tortilla “crust” to give this dish a healthy Mexican theme worthy of a fiesta! Serve with salsa on the side. Preheat oven to 400 degrees. In a medium pot, boil water and blanch asparagus (ends cut off) or fiddleheads for 1 to 2 minutes. Drain and immerse in an ice bath to retain their green color. Chop in large pieces and set aside. In a saute pan with 1-2 tablespoons olive oil, saute onions and garlic on medium heat for approximately two minutes till just softened. Add tomatoes and saute for one more minute. Sprinkle with salt and pepper and set aside. In a medium bowl, whisk eggs, nutmeg, half of chopped chives, salt and pepper. Brush a deep dish pie plate with olive oil and place tortilla round on bottom. Add spinach and sprinkle with the rest of chives and herbs, tomato/onion mixture, asparagus or ramps and cheese. Add eggs and bake in oven for approximately 20 minutes or until middle is just firm and slightly puffed. Who knew healthy cooking could be so fun and tasty! Great for Girls’ Night Out gatherings! Contact Barb for details and to schedule your Fresh Food Cooking Event! A sweet and savory hors d’oeuvres reminiscent of Tuscany. The balsamic-maple reduction makes this dish special. Place a jar of syrup on the side for extra dipping and drizzling. Serve with fresh figs if desired. Macerate figs in balsamic vinegar for 1 hour or more. Meanwhile, roll goat cheese log in chopped pistachios. Wrap and refrigerate. Place maple syrup and vinegar in a small sauce pan. Stir and add figs. Simmer on medium heat for 5 minutes. Remove figs and continue simmering until 1/4th of liquid is reduced, approx. 15 – 20 minutes. Cool and refrigerate for 1 hour. Note: Be careful not to overcook or balsamic-maple syrup will thicken to taffy like consistency when cooled. 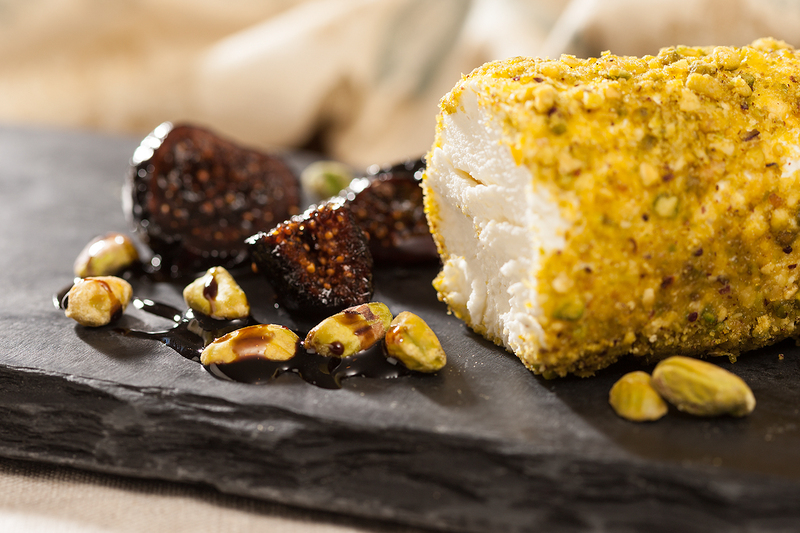 Sprinkle whole pistachios on the plate and serve goat cheese log with figs and drizzled syrup. Maple sweetness is a winning combination with spicy chipotle, garlic and rosemary. Photo by White Point Imaging. Preheat the oven to 425 degrees. Wash the chicken and rub olive oil, salt and pepper on the outside skin and inside the cavity. Stuff the cavity with 2 slivered garlic cloves, herbs and lemon. Tie the legs with chicken string. 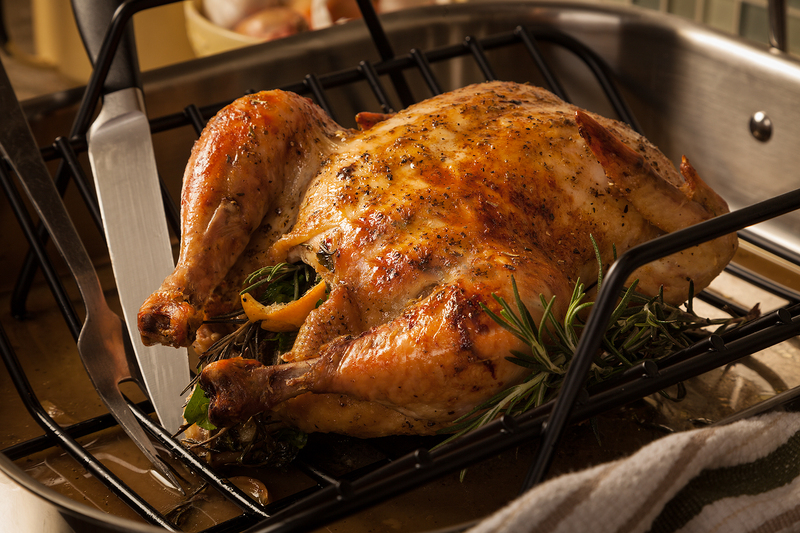 Place chicken on a roasting rack inside a heavy roasting pan. Add water or chicken broth 1/2 inch up the pan. Add garlic slivers to the broth. Tent chicken with tin foil and roast for 25 minutes. Baste chicken and lower heat to 350 degrees. Continue basting chicken every 20 minutes with broth and drippings for approximately 1 to 1 1/2 hours depending on the size of the bird. Meanwhile, mix glaze ingredients together, adding oil last until thoroughly incorporated. Thirty minutes before the chicken is done, remove foil tent and brush on half of the glaze. Roast for 15 more minutes. Brush on remaining glaze and roast until 185 degrees registers on a meat thermometer and chicken is golden brown. Remove from the oven and let sit 15 minutes before carving. For a simple gravy, first degrease the pan drippings. Add tapioca starch or cornstarch paste (mix 3 Tablespoons water to 1 Tablespoon starch) to the pan and heat while whisking to thicken the juices into a gravy. Add more rosemary and maple syrup if desired. Briskly whisk in more paste if thicker gravy is desired. Salt and pepper to taste. You’ll want to eat every crumb! Photo by White Point Imaging. 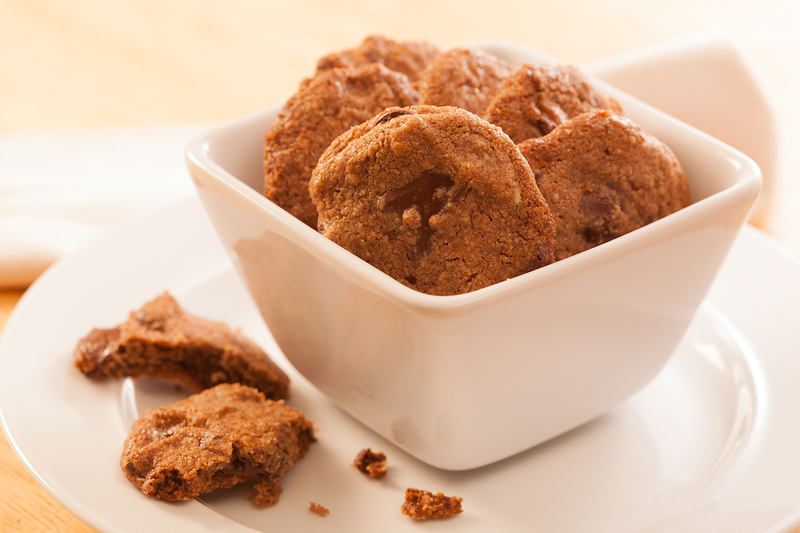 These lightly sweetened cookies laced with maple syrup are made with teff flour, a naturally gluten-free artisan grain. Inspired by Shiloh Farms’ peanut butter cookie recipe, I made my own dark chocolate chunk version substituting almond butter and adding almond flour for a yummy tea-like cookie-biscuit. Preheat oven to 350 degrees. Pulse wet ingredients in a food processor until thoroughly mixed. Place in a bowl and mix in dry ingredients. Form dough into balls and place on parchment lined cookie sheet. Lightly flatten dough with a spatula to cookie size and bake for 12-15 minutes. Cookies are crumbly when hot. Carefully transfer to a wire rack to cool. Makes approximately 2 dozen. This one pot meal couldn’t be easier to make and will fill you up on a cold winter’s night! Winter calls for savory meals slow cooked in what used to be called the crock pot. Slow cooking breaks down meats, root veggies and other ingredients so digestion is easier when your body is working hard to stay warm. The shank bone intensifies the flavor and adds minerals for your bone and joint health. Lentils absorb the rich taste of the liquid at the end of cooking and enhances the hardiness of this meal. Place all ingredients except lentils in slow cooker. Add more beef broth if needed. Set slow cooker for 6 to 8 hours, stirring every hour. Add lentils the last hour of cooking. 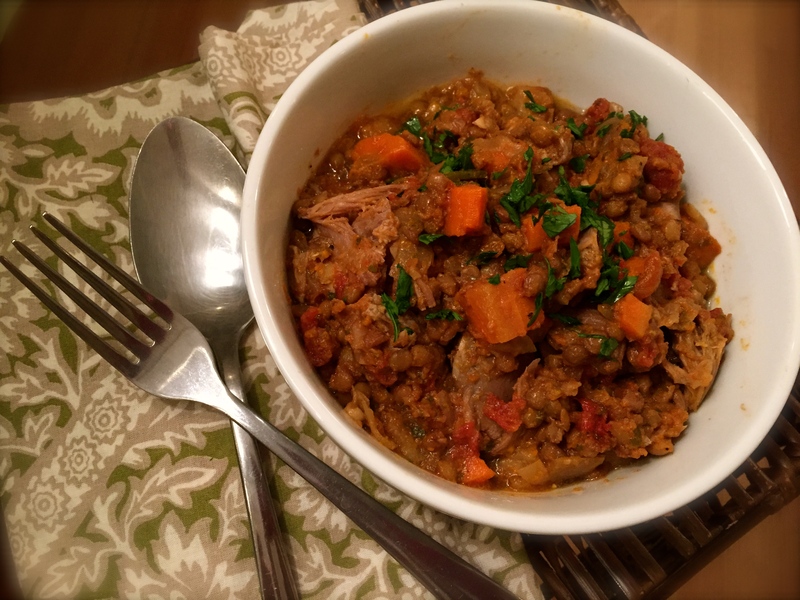 When done, meat should fall “off the bone” and lentils should be soft but not mushy, absorbing much of the liquid to become stew-like consistency. Cut any excess meat off the bone, add to the stew and discard the bone and bay leaf. Garnish with fresh chopped parsley. Serves two. Chicken easily shreds off the bone after braising in the slow cooker for hours. Nothing beats hot chicken soup on a cold winter day. And this recipe warms you up even more with some spice to create a little more heat. Dial down on the chili powder and omit chile seeds if you want a milder soup. With the nice surprise of an artisan grain like farro instead of the usually rice, this is a one-pot one-bowl meal that everyone will love! 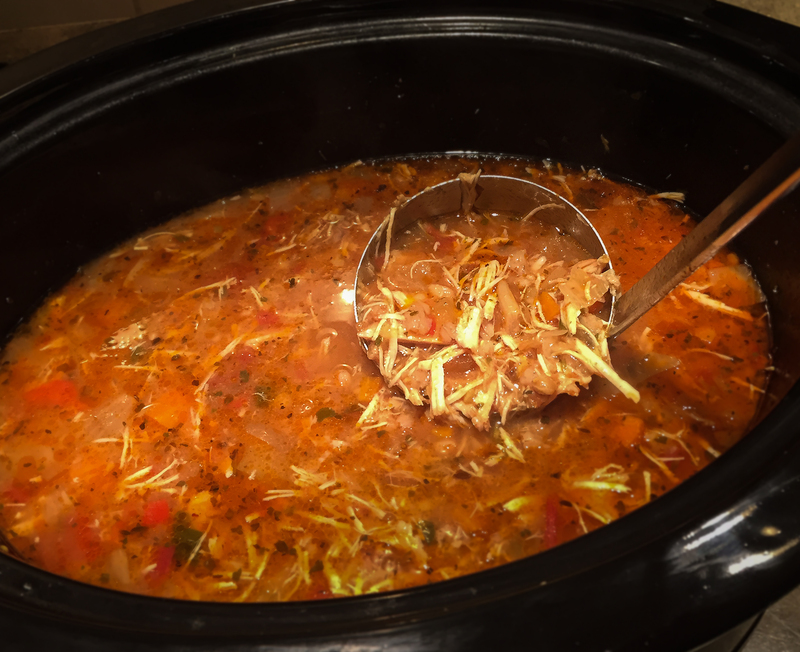 Arrange all ingredients in layers in a slow cooker except chicken, broth and farro. Place chicken on top and pour in broth so that chicken is half covered and will braise in the liquid. Cover and set cooking time for 8 hours. After approximately 5 hours, remove chicken breasts, shred chicken with a fork, cover and set aside. Continue cooking the remaining chicken and broth and in the final hour, add farro and more broth for a soupier consistency. When farro is fully cooked in the tomato-chicken broth, remove other chicken pieces and any bones, and discard. Skim off chicken fat on top with a spoon. Add the shredded chicken to the pot and stir. Ladle in soup bowls and garnish with extra parsley. Serves 6. Top with farm fresh poached, fried or over easy eggs and let the runny yolks soak into the hash for a hardy winter breakfast! 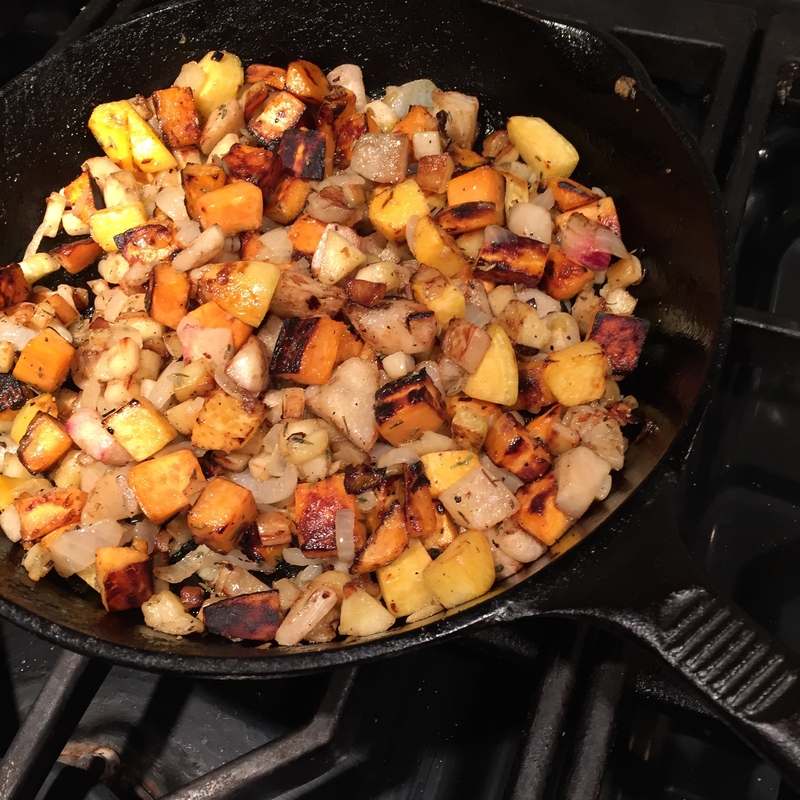 Instead of regular ho-hum home fries, make your morning meal burst with color by serving seasonal hash loaded with sweet and savory root veggies. This dish also teams up well with poultry or a burger. Since parsnips are chopped small, add to skillet after other roots are half cooked. Carrots can be substituted for parsnips, but add sooner to the skillet along with the sweet potatoes and turnips as they take a bit longer to cook. Grapeseed oil is used for it’s high-heat qualities, while olive oil is added near the end of cooking for a little more taste. In a large cast iron or heavy skillet, heat grapeseed oil over medium high heat. Add onions and saute until translucent. Set aside. Toss sweet potatoes and turnips into skillet and add more grapeseed oil as needed. Allow a few minutes without stirring until roots start to brown and caramelize on one side. Stir and allow more browning to occur (without burning). Add parsnips and olive oil when potatoes and turnips are half-way softened. Sprinkle in thyme, salt, pepper and paprika to taste. Add onions. Stir and continue to cook until all veggies are fork tender. Serves 4. For the freshest sprouts, seek out these green gems on the stalk. 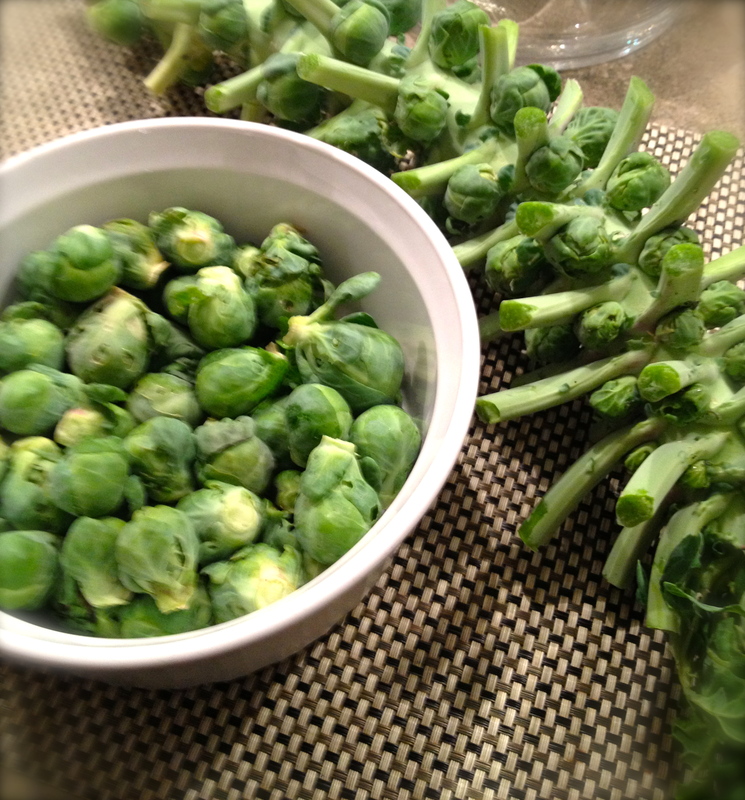 I can’t get enough of these cruciferous veggies! When Brussel Sprouts are roasted with garlic, their flavor really pops. The additional tastes and textures from chestnuts and pomegranate seeds really adds to this dish. I highly recommend farm fresh slab bacon in this recipe, but if you can’t find it, try a natural Sunday bacon or pancetta instead. And for gardeners, remember to harvest Brussel Sprouts after a frost or two. They are hardy enough to withstand the drop in temp which only adds to their sweetness. Preheat oven to 400 degrees. In a heavy skillet, cook bacon until crisp and let drain on paper towels. Trim sprouts from the stalk and cut each one in half, top to stem. In a large bowl, toss sprouts with 1/4 cup olive oil and garlic (a good quality garlic olive oil or garlic sea salt works in a pinch if you want to skip mincing garlic). Add sea salt and pepper to taste, and more oil if needed to throughly coat. Toss again. Place on a baking sheet face down and roast for 5 minutes. Meanwhile in the same bowl, toss leeks and chestnuts with 2 Tablespoons olive oil, salt and pepper and sprinkle over sprouts. Continue roasting until sprouts are soft and caramelized on the bottom. Top leaves will also brown and dry resembling parchment paper which adds to the texture and taste of the dish, although be careful not to over-roast or burn. Remove from oven and toss with pomegranate seeds and crumbled bacon in the baking sheet to warm up all ingredients. Transfer to a serving dish or platter and drizzle with an aged balsamic vinegar (I love fig balsamic vinegar on the dish). Serve.